Tonight I will be hosting the second #Veggielovechat twitter party for the UK. #Veggielovechat is a popular vegetarian & vegan twitter party which was started by Nicole from the wonderful US vegetarian blog Pepperoni is Not a Vegetable. The US edition of #Veggielovechat is held at 9pm US Central time which is 6 hours behind GMT and Nicole has been hosting the party for quite a while. I found this twitter party whilst up with the toddler one Sunday night at 3am. I joined in and picked up loads of fab veggie tips. I really wanted to join in every week but being up at 3am every Sunday night when I had to do the school run a few hours later just wasn't feasible. I knew that Nicole had mentioned doing a #veggielovechat at a more UK friendly time and so I asked her if I could host a UK edition of #Veggielovechat for people in the UK. Nicole kindly agreed and we have decided to use the same hashtag for the UK and US edition so that people can read each others tweets. Last week we held the first #Veggielovechat UK twitter party and we had quite a few vegan and vegetarian peeps come and chat online with us. There was some great veggie tips, including finding out that Aldi sell veggie sweets and that there is a great burger place in London for a good vegan burger!. 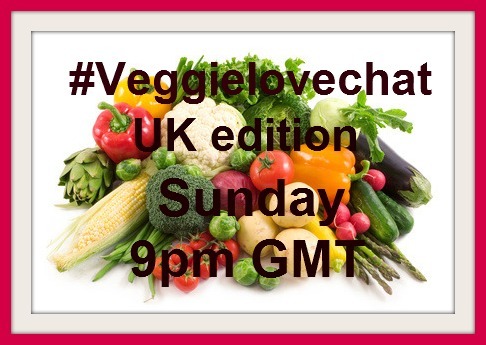 I will now be running a UK edition of #Veggielovechat at 9pm GMT on Sunday evenings. The chat is predominantly for people in the UK, but if the time works for you, then come and join in and say Hi!. If the time doesn't suit, then please do go and join the US edition hosted by Nicole at 9pm CST. Thanks to Nicole for kindly lending her hashtag to us UK tweeps and if you are Vegetarian or Vegan and would like to come and chat all things veggie with others, please do come and join #Veggielovechat at 9pm GMT or 9PM CST on Sunday's and tell others too!! sounds like lots of fun! Im sorry i missed it! I'll try to rmb that this sunday. may not be vegetarian or vegan but I absolutely love vegetables, and eat a lot more of them than meat actually, so would love to pick up and share tips with other veg lovers. is that alright? Hi Shu thanks for stopping by - def come and join us for some chat at 9pm - will be good to see you! !